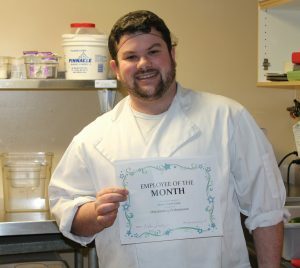 Introducing SACR Employee Of The Month January 2019 Chace! Chace joined the food services team at SACR in December 2016, and since then has willingly taken on every single role in the kitchen, from dietary aide to cook to dishwasher, all with equal enthusiasm and attention to detail. He is a true team player who always goes above and beyond his duties not only in the kitchen, but is also always willing to lend a helping hand to anyone who needs it throughout the residence. He has a jovial personality, always smiling and friendly with everyone he meets. Chace is kind and respectful with our residents and team members alike, a true joy to work with. It is having team members like you with initiative, a positive attitude, and who provide exceptional service with a smile which makes Sidney All Care a great place to work. Thank you Chace for your dedication to the Sidney All Care team! Congratulations!